chrisandshawn1997 This hat came in quickly and was a perfect addition to our Scarecrow outfit. It was so cute everyone wanted to know where we got it. ceseve99 great product...it totally made my costume seem much more realistic! 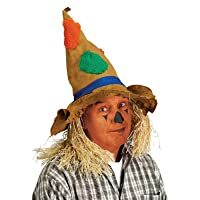 Beistle 90731 Scarecrow Hat is a tan fabric hat with a blue band and scarecrow patches. It also has straw hair attached. It is one size fits most. Dress up like a scarecrow or place it on the head of your homemade scarecrow!